This framework draws attention to the ways in which the stories and processes inherent in each landscape are closely intertwined with those of the others. For example, the agricultural history of Burlington and the surrounding area is largely determined by the underlying geology, and, in turn, exerts tremendous influence on the type and quality of wildlife habitat. 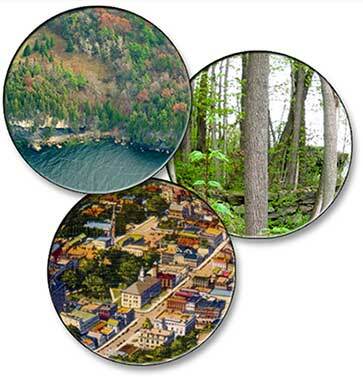 Through using all three of these lenses, we can move toward seeing Burlington as an integrated set of patterns shaped by a series of natural and human processes. This website will not teach you all that you need to know about geography, history, geology, or ecology, but it will help you decipher the patterns of and the stories behind the Burlington Landscape. It will also help you find key materials for landscape interpretation that are useful for deeper investigations. The key to a successful landscape analysis is in finding the relevant details within the larger story. So as you explore this website and your own local resources, keep asking yourself how the information explains what you have experienced in and around Burlington.